Reusable wooden crate holds our best selection of fresh cheeses! Crate contains 10 oz. 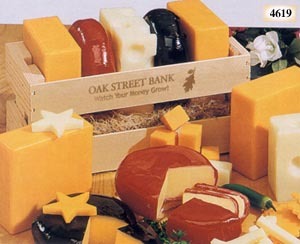 each of Aged Cheddar, Mellow Colby, and Buttery Swiss, plus 7 oz. wheels of Gouda and Edam. Crate can be laser engraved. Net weight: 2 lbs. 12 oz. Shipping weight: 4 lbs. Measures 9” x 4 3/8” x 4 3/8”. Case pack: 6. Prices shown per piece. Engraving area: 5” x 1”. Perishable, keep refrigerated! 2-day shipping with blue ice is recommended year round, but is required in the months of March through October. 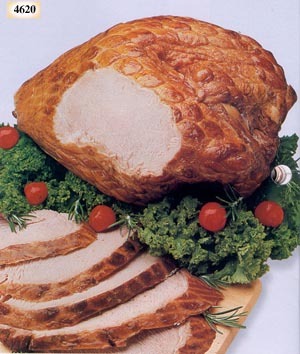 Slow cooked to a delicate flavor, this turkey breast is fully cooked and ready to eat. Serve cold or hot. Net weight: 4-7 lbs. Shipping weight: 8 lbs. Case pack: 1. Prices shown per piece. Engraving area: 5” x 1”. Our moist tender bird has the enticing flavor only slow, careful smoking over a hardwood fire can produce. Ready to eat hot or cold. Net weight: 10-12 lbs. Shipping weight: 13 lbs. Case pack: 1. Prices shown per piece. Engraving area: 6” x 3”. 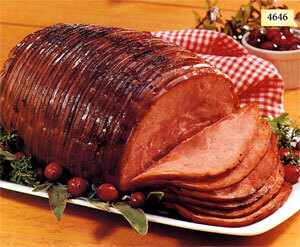 A succulent, fully cooked, spiral-sliced, honey-glazed, boneless ham is easy to serve and makes a splendid business gift. Net weight: 3 lbs. Shipping weight: 5 lbs. Case pack: 1. Prices shown per piece. Engraving area: 5” x 1”.